This was an idea I had in 2011 to build a dashboard for my data - a kind of Google analytics for your life. I aggregated my data to see if I could uncover insights about my life. This was in the early days of device APIs so it wasn’t an easy task but with the help of an engineer I managed to aggregate data across several devices. 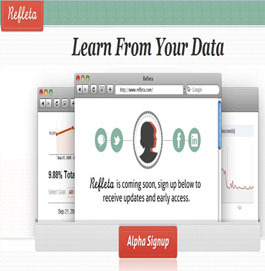 I then put up version one of Refleta and paid for some users on UserTesting.com to give it a whirl. Most of America had not heard of a FitBit or a Withings scale at that time. Even with a link to purchase these devices, the feedback was “Too rich for my blood.” Meaning many of the women who were given the option found the devices too expensive. I realized I had ignored the central question that I knew from experience to always answer: What’s the problem you’re solving? In an effort to zero in on a clear value proposition I set up an AdWords campaign and created text ads. The results validated my gut. The main problems people have are the problems we’ve had since time eternal. They fall into four main categories: health, wealth, relationships, and career/life purpose. I created text ads in all four categories. The text ad that won out over all the text ads I created? Headline: Why can’t I lose weight? 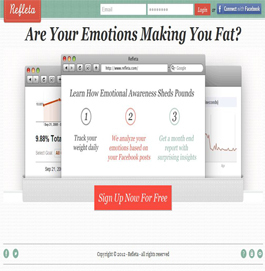 Could aggregating my data across various sources help me to lose weight? If I could crack that, I thought, I’d be a genius. After a quick analysis of my financial data uncovered a cupcake consumption issue, I started to explore the connection between financial data, geography, and weight. I also discovered what every great marketer already knows – get in someone’s flow and you greatly influence their behavior. In fact, proximity, is the number one predictor of behavior. Why do you think there are Starbucks across the street from each other? Even when I could pull the data together and present it to a user, would it affect outcomes? 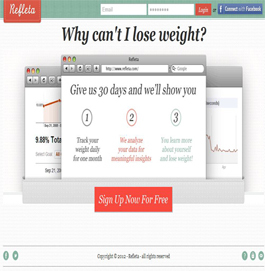 I began testing different landing pages and ways of positioning Refleta to see if I could get at the many reasons people over-eat or make poor food choices. This time I switched to hooking up APIs for services that I knew many in middle America already used like Facebook and to a lesser extent, Twitter. I also came up with an easy way to get weight data – via text. Instead of asking users to weigh themselves using Withings and then pulling in their data, I asked users to sign up for a daily text reminder asking for their weight. I also asked users for their financial data via Mint.com (they didn't have an API so I built a web scraper – sorry Mint!) or a csv upload. Most users had Facebook accounts but they were very much against signing up initially with Facebook alone. Important finding: when we first only allowed Facebook sign up and did not allow for email registration traffic dropped off by over 80%. When we added in the option to sign up using an email, things started clicking. Once visitors signed up with email and saw what they were getting into, most hooked up their Facebook accounts. What could I do with Facebook/Twitter accounts you ask? I used these as a proxy for emotions. One of my hypotheses was that most people over-eat or make poor food choices based on their emotions. At the same time, I persuaded a PhD student to analyze my weight data alongside my emotions data from my gottaFeeling app. He found no direct correlation between say angry feelings and gaining weight –with lots of caveats. Caveats like the limited data set, the timing of when I logged an emotion versus when I weighed myself, how weight can’t tell you when and why you’re eating –just that you are doing too much or too little of it, etc. See his report. This doesn’t mean emotions don’t affect your weight; there just might be a more direct connection with when, what, and how much you eat. So how do you get at that information? Calorie tracking, of course. Again even with calorie tracking there might be disparities based on timing of emotions and the ephemeral nature of emotions. But the real problem was that all of the calorie tracking apps at the time did not share their data, did not allow users to export their data nor did they make APIs available. No problem, I thought. Like I was able to with my cupcake data, I figured I could get at calorie consumption via a person's financial data. I even came up with a formula for estimating calorie consumption per individual in a home with multiple people and a calorie per dollar equation. I thought using financial data would be even easier than users having to log calories. The financial information, however, didn’t go over well with test users. The first issue was that people did not at first understand the correlation between their credit card transactions and their weight. Even after we addressed that question, it turned out that most women (horribly way too many) claimed to not have access to their financial data or told us their Mint accounts were in their husbands’ names (for shame!). The one thing that did work the best, however, was asking for weight via text. Just asking, like what happens with calorie tracking, triggered users to weigh themselves and the very act of weighing themselves helped them to lose weight (this has been proven through research, and for how simple text messaging programs have been shown to help participants lose weight see this journal article). Again, weighing yourself is an act of mindfulness. It’s not fun, but it’s more difficult to avoid the fact that you’re getting bigger when you’re staring down at the numbers. So again, this version wasn’t working. I wasn’t delivering on the promise. While some users actually lost weight, it wasn’t because I was giving them any interesting information, it was purely from replying to my daily morning text. In the end, I stopped work on Refleta and chalked it up to a learning experience. The market has changed since then - but not a lot. There are more APIs and it's easier to connect to them, but personal analytics are still not terribly mainstream. People only care to understand themselves better when they want to change something about themselves. So you really can't talk about personal analytics without addressing behavior change. As I discovered, tracking is a tool for change. The act of tracking is really an act of mindfulness - bringing what you're doing into the forefront of your awareness, and mindfulness has been shown by numerous studies (and Buddhism) to affect attitudes and behavior. But that tool is limited. Still, I think Refleta is an example of what I believe you'll see in the data space - whether for enterprises or consumers - an application that collects, analyzes, visualizes, and recommends based on cross-dimensional data. Of course, artificial intelligence will only make this a lot easier. Though the applications that will stand out for consumers will be those that tell consumers something they didn't already know about themselves and help them to act on that information. With the latter being the toughest nut to crack. Today, a lot of the data is open and available and relatively seamless to put together (see APIs and note: I didn't say easily) without much manual intervention. But, ironically, to maintain change over time, most behavioral studies show that some manual entry is required (to encourage mindfulness and commitment to the activity). So any application meant to help consumers likely can't be entirely automated. It will be a balance. Such is life, no? Either way, I see the pieces of this puzzle coming together and I'm excited to see how it evolves.